Laetoli is the name of an archaeological site in northern Tanzania, where the footprints of three hominins--ancient human ancestors and most likely Australopithecus afarensis--were preserved in the ash fall of a volcanic eruption some 3.63-3.85 million years ago. They represent the oldest hominin footprints yet discovered on the planet. The Laetoli footprints were discovered in 1976, eroding out of a gully of the Nagarusi river, by team members from Mary Leakey's expedition to the main Laetoli site. Laetoli lies in the eastern branch of the Great Rift Valley of eastern Africa, near the Serengeti Plain and not far from Olduvai Gorge. Three and a half million years ago, the region was a mosaic of different ecotones: montane forests, dry and moist woodlands, wooded and unwooded grasslands, all within about 50 km (31 miles) of the footprints. Most Australopithecine sites are located within such regions--places with a wide variety of plants and animals nearby. The ash was wet when the hominins walked through it, and their soft print impressions have given scholars in-depth information about the soft tissue and gait of Australopithecines not available from skeletal material. The hominin prints are not the only footprints preserved in the wet ashfall: animals walking through the wet ash included elephants, giraffes, rhinoceroses and a wide variety of extinct mammals. In all there are 16 sites with footprints in Laetoli, the largest of which has 18,000 footprints, representing 17 different families of animals within an area of about 800 square meters (8100 square feet). The Laetoli hominin footprints are arranged in two 27.5 meter (89 foot) long trails, created in moist volcanic ash which later hardened because of desiccation and chemical change. Three hominin individuals are represented, called G1, G2, and G3. Apparently, G1 and G2 walked side by side, and G3 followed along behind, stepping on some but not all of the 31 footprints of G2. Based on known ratios of the length of a bipedal foot versus hip height, G1, represented by 38 footprints, was the shortest individual of the three, estimated at 1.26 meters (4.1 feet) or less in height. Individuals G2 and G3 were larger--G3 was estimated at 1.4 m (4.6 ft) tall. G2's steps were too obscured by G3's to estimate his/her height. Of the two tracks, G1's footprints are the best preserved; the track with footprints of both G2/G3 proved difficult to read, since they overlapped. A recent study (Bennett 2016) has allowed scholars to identify G3's steps apart from G2 more clearly, and reassess the hominin heights--G1 at 1.3 m (4.2 ft), G3 at 1.53 m (5 ft). At least two sets of the footprints have been definitely linked to A. afarensis, because, like the fossils of afarensis, the Laetoli footprints do not indicate an opposable great toe. Further, the only hominin associated with Laetoli area at the time is A. afarensis. 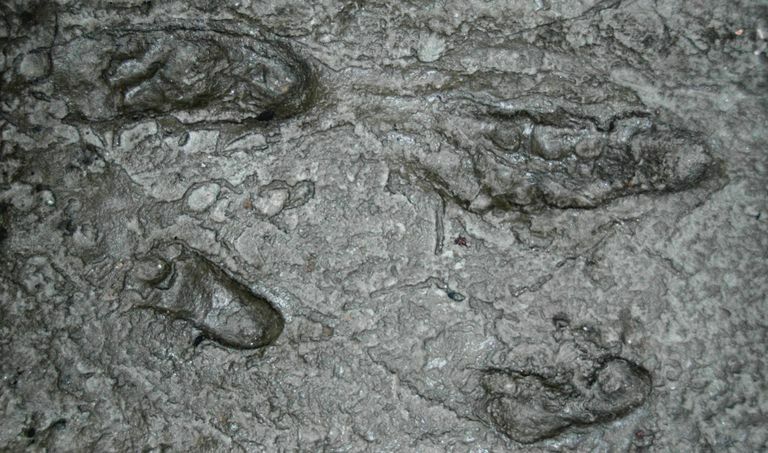 Some scholars have ventured to argue that the footprints are from an adult male and female (G2 and G3) and a child (G1); others say they were two males and a female. Three dimensional imaging of the tracks reported in 2016 (Bennett et al.) suggests that G1's foot had a different shape and depth of heel, a different hallux abduction and a different definition of the toes. They suggest three possible reasons; G1 is a different hominin from the other two; G1 walked at a different time from G2 and G3 when the ash was sufficiently different in texture, producing differently shaped impressions; or, the differences are a result of foot size / sexual dimorphism. In other words, G1 may have been, as others have argued, a child or a small woman of the same species. While there is some ongoing debate, most researchers believe that the Laetoli footprints show that our Australopithecine ancestors were fully bipedal, and walked in a modern manner, heel first, then toe. Although a recent study (Raichlen et al. 2008) suggests that the speed at which the footprints were made might affect the kind of gait required to make the marks; a later experimental study also led by Raichlen (2010) provides additional support for bipedalism at Laetoli. The volcanic tuff in which the footprints were made (called the Footprint Tuff or Tuff 7 at Laetoli) is a 12-15 centimeter (4.7-6 inches) thick layer of ash which fell on this region from the eruption of a nearby volcano. The hominins and a wide variety of other animals survived the eruption--their footprints in the muddy ash prove that--but which volcano erupted has not been determined. Until relatively recently, the source of the volcanic tuff was thought to be the Sadiman volcano. Sadiman, located about 20 km (14.4 mi) southeast of Laetoli, is now dormant, but was active between 4.8 and 3.3 million years ago. A recent examination of outflows from Sadiman (Zaitsev et al 2011) showed that the geology of Sadiman does not fit perfectly with the tuff at Laetoli. In 2015, Zaitsev and colleagues confirmed that it was not Sadiman and suggested that the presence of nephelinite in Tuff 7 points to the nearby Mosonic volcano, but admit that there is not conclusive proof as of yet. At the time of excavation, the footprints were buried between a few cm to 27 cm (11 in) deep. After excavation, they were reburied to preserve them, but the seeds of an acacia tree was buried within the soil and several acacias grew in the region to heights of over two meters before researchers noticed. Investigation showed that although those acacia roots did disturb some of the footprints, burying the footprints was overall a good strategy and did protect much of the trackway. A new conservation technique was begun in 1994 consisting of application of a herbicide to kill all the trees and brush, the placement of biobarrier mesh to inhibit root growth and then a layer of lava boulders. A monitoring trench was installed to keep an eye on the subsurface integrity. See Agnew and colleagues for additional information on the preservation activities. 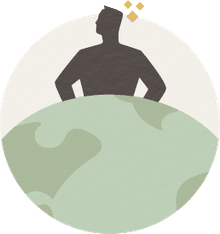 This glossary entry is a part of the About.com guide to Lower Paleolithic, and the Dictionary of Archaeology. Agnew N, and Demas M. 1998. Preserving the Laetoli foodprints. Scientific American 279(44-55). Barboni D. 2014. Vegetation of Northern Tanzania during the Plio-Pleistocene: A synthesis of the paleobotanical evidences from Laetoli, Olduvai, and Peninj hominin sites. Quaternary International 322–323:264-276. Bennett MR, Harris JWK, Richmond BG, Braun DR, Mbua E, Kiura P, Olago D, Kibunjia M, Omuombo C, Behrensmeyer AK et al. 2009. Early Hominin Foot Morphology Based on 1.5-Million-Year-Old Footprints from Ileret, Kenya. Science 323:1197-1201. Bennett MR, Reynolds SC, Morse SA, and Budka M. 2016. Laetoli’s lost tracks: 3D generated mean shape and missing footprints. Scientific Reports 6:21916. Crompton RH, Pataky TC, Savage R, D'Août K, Bennett MR, Day MH, Bates K, Morse S, and Sellers WI. 2012. Human-like external function of the foot, and fully upright gait, confirmed in the 3.66 million year old Laetoli hominin footprints by topographic statistics, experimental footprint-formation and computer simulation. Journal of The Royal Society Interface 9(69):707-719. Feibel CS, Agnew N, Latimer B, Demas M, Marshall F, Waane SAC, and Schmid P. 1995. The Laetoli Hominid footprints--A preliminary report on the conservation and scientific restudy. Evolutionary Anthropology 4(5):149-154. Johanson DC, and White TD. 1979. A systematic assessment of early African hominids. Science 203(4378):321-330. Kimbel WH, Lockwood CA, Ward CV, Leakey MG, Rak Y, and Johanson DC. 2006. Was Australopithecus anamensis ancestral to A. afarensis? A case of anagenesis in the hominin fossil record. Journal of Human Evolution 51:134-152. Leakey MD, and Hay RL. 1979. Pliocene footprints in the Laetolil Beds at Laetoli, northern Tanzania. Nature 278(5702):317-323. Raichlen DA, Gordon AD, Harcourt-Smith WEH, Foster AD, and Haas WR, Jr. 2010. Laetoli Footprints Preserve Earliest Direct Evidence of Human-Like Bipedal Biomechanics. PLoS ONE 5(3):e9769. Raichlen DA, Pontzer H, and Sockol MD. 2008. The Laetoli footprints and early hominin locomotor kinematics. Journal of Human Evolution 54(1):112-117. Su DF, and Harrison T. 2015. The paleoecology of the Upper Laetolil Beds, Laetoli Tanzania: A review and synthesis. Journal of African Earth Sciences 101:405-419. Tuttle RH, Webb DM, and Baksh M. 1991. Laetoli toes and Australopithecus afarensis. Human Evolution 6(3):193-200. Zaitsev AN, Spratt J, Sharygin VV, Wenzel T, Zaitseva OA, and Markl G. 2015. Mineralogy of the Laetolil Footprint Tuff: A comparison with possible volcanic sources from the Crater Highlands and Gregory Rift. Journal of African Earth Sciences 111:214-221. Zaitsev AN, Wenzel T, Spratt J, Williams TC, Strekopytov S, Sharygin VV, Petrov SV, Golovina TA, Zaitseva EO, and Markl G. 2011. Was Sadiman volcano a source for the Laetoli Footprint Tuff? Journal of Human Evolution 61(1):121-124.